Draft: 2003, Seattle Mariners, C1th rd. Married to Audie…has 2 sons, August Russell and Axel William…his father-in-law is Jean Fugett, who played tight end for the Cowboys (1972-75) and Redskins ('76-79). Is 1-of-31 active players with 1,500 or more career hits...Recorded his 1,500th career hit on 4/24 vs. TB...Collected his 1,500th hit with the Orioles on 5/31 vs. NYY...Since 2012, ranks eighth among active Major Leaguers with 176 home runs...Ranks fifth on the O's all-time home run list (248)...Ranks fifth on the Orioles all-time RBI list (803)...Appeared in all eight games in the World Baseball Classic for the World Champion Team USA…Helped Team USA advance to semi-final round by robbing Orioles teammate Manny Machado (Team Dominican Republic) of a home run with a leaping catch in the 7th inning in the first round of the WBC…Batted .243 (7-for-35) with two home runs and five RBI in eight games...Became the all-time home run leader at Oriole Park (now with 137), passing Rafael Palmeiro (124) on 5/22 vs. MIN...Became the all-time RBI leader at Oriole Park (now with 438), passing Cal Ripken, Jr. (368) on 6/4/16 vs. NYY... Recorded hits number 1,614 and 1,615 as an Oriole on 9/22 vs. TB to pass Brady Anderson (1,614) for sole possession of fourth place on the Orioles all-time hits list (since 1954)...Hit his 25th home run of the season on 8/28 to become first player in O's history to have seven consecutive seasons of 25-or-more home runs and is one of 28 players since 1990 with at least seven straight...According to STATS, LLC., his seven consecutive seasons with at least 25 home runs is the third-longest streak among active players, and the longest active streak (Encarnación, Trout; six-straight)...Recorded his 10th-straight season with 100-or-more hits...Ranked first in the AL with a .361 batting average (44-for-122) with RISP (46 RBI)...Finished 11th in the AL in hits (170) and tied for 11th in multi-hit games (49)...Ejected in the bottom of the first inning on 9/1 vs. TOR by Home Plate umpire Pat Hoberg (second career ejection)...Notched a season-high and career-high with four hits twice (7/23 vs. HOU and 8/21 vs. OAK)...Hit his 20th home run of the season on 8/5 for his seventh straight season with 20-or-more home runs...According to STATS, LLC., his seven-straight seasons with at least 20 home runs ranks third in O's history...Hit his first lead-off home run of the season on 7/19 vs. TEX, his sixth career lead-off home run...Slugged his 11th career multi-homer game on 7/9 at MIN and matched his career-high with five RBI. Registered his ninth consecutive season with at least 100 hits...Has posted six straight seasons (since 2011) with 25 or more home runs...Since 2012, ranks ninth among all Major League hitters with 150 home runs...Left the 8/26 game at NYY in the bottom of the second inning with a left hamstring strain...Was one of four Orioles to homer in the first inning on 8.19 vs. Houston before the Astros recorded an out (first time in Major...League history since 1900, according to STATS, LLC. )...Hit 11 home runs in June, tied for the Major League lead...His 27 RBI in June ranked tied for fourth among Major League players...Hit five leadoff home runs (9.10 at DET, 8.19 vs. HOU, 7.28 at MIN, 7.8 vs. LAA, 6.28 at SD)...Hit his 200th home run as an Oriole on 6.2 vs. BOS...Was his second home run of the night, his first multi-home run game of the season and ninth of his career...Hit his 200th career home run on 5/13 vs. DET, becoming the second player (also Ted Williams, 400) to hit a century milestone...home run (200 or higher) in a 1-0 game...Tied his career-high for the 19th time with four hits on 8/23 vs. WAS...Ranks ninth on the Orioles all-time hits list (1,448)...Had an 11-game hitting steak from 6/19-30 in which he hit .396 (19-for-48) with two doubles, three home runs, and 10 RBI...Ranks sixth on the Orioles all-time home run list (222)...R. Palmeiro ranks ffth with 223...Ranks seventh on the Orioles all-time RBI list (730)...B. Anderson ranks sixth (744)... Ranks second on the Oriole Park home runs list with 120 homers...Rafael Palmeiro leads the ballpark's home runs list with 124...Became the all-time RBI leader at Oriole Park (now with 396), passing Cal Ripken, Jr. (368) on 6/4 vs. NYY...Is the all-time extra-base hits leader at Oriole Park (now with 258), surpassing Brady Anderson (243) on 6/6 vs. KC...Named the Orioles recipient of the Roberto Clemente Award and earned the Orioles Heart and Hustle Award...Started in center field in the 2016 AL Wild Card Game at Toronto (1-for-5, 1 R). Led all Orioles outfielders and finished tied for fifth among AL outfielders with 13 outfield assists • Became the first outfielder in Orioles history to log at least 25 home runs over five straight seasons (since 2011) • Named a starting OF for the 2015 All-Star Game, replacing the injured Alex Gordon, after finishing as the top vote-getter among his peers (player selection) • Was the starting left fielder in the All-Star Game (his third straight ASG start) and went 0-for-2...Was his fifth career All-Star selection and fourth straight • Currently ranks seventh on the Orioles all-time home runs list with 193 and 10th on the Orioles all-time RBI list with 647 • Passed Ken Singleton for seventh place on the Orioles home run list on 7/31 vs. DET and passed Paul Blair for 10th place on the Orioles RBI list on 4/10 vs. TOR • Ranked in the top 10 among AL outfielders in assists per 9.0 inn. (sixth, 0.10), Range Factor per game (seventh, 2.46), putouts per 9.0 inn. (eighth, 2.44), and range factor per 9.0 inn. (eighth, 2.54) • Posted two multi-homer games (7/12 vs. WAS, 8/16 vs. OAK) • Hit his 100th career home run at Oriole Park on 7/31 vs. DET, becoming the second player to hit 100 or more homers at OPACY in ballpark history (Rafael Palmeiro, 124) • Tied a career-high with four hits for the third time in 2015 on 5/3 at TB...His three four-hit games tied a single-season career-high (also 2014, 2011) • Became the first Oriole since 1954 to record three four-hit (or more) games within the team's first 23 games...Became the second player in franchise history to accomplish the feat (since 1914) along with with Baby Doll Jacobson (St. Louis Browns, 1924) • Exited 9/7 at NYY in the eighth inning with right shoulder soreness • Named the Orioles' 2015 Heart and Hustle Award winner by the Major League Baseball Players Alumni Association (three-time recipient)…The award as voted on by former players, honors an active player who "demonstrates a passion for the game of baseball and best embodies the values, spirit and traditions of the game" according to the MLBPAA • Named the Brooks Robinson Community Service recipient by the MLBPAA • Chosen as the MLB Players Choice 2015 Marvin Miller Man of the Year, which honors a player's success on the diamond and his willingness to give back to the community. In his 7th full season with the O's, posted his 4th straight season playing 150 games and posting at least a .280 average, 25 doubles, 25 HR, and 80 RBI, joining Cal Ripken, Jr. (1983-86) and Eddie Murray (1977-1980 and 1982-85) as the only players to do it in four straight seasons in O's history...Is one of nine big leaguers to play in at least 150 games in each of the last four seasons...Finished 9th in the AL with 29 HR, becoming the 1st Orioles OF with four straight seasons of 25+ HR and the 1st Oriole to do so since Rafael Palmeiro (1995-98)...Selected by the fan vote to his 2nd straight starting spot, and 4th overall appearance, in the All-Star Game (also 2009, 2012, 2013)...Competed in the 2014 Home Run Derby, eliminated in the 2nd round...Named Co-AL Player of the Week (with Steve Pearce) for the week of June 30-July 6...Led AL CF in games played (155) and ranked 4th in assists (7) and 5th in putouts (374)...Batted .344/.399/.604 with 9 HR and 20 RBI in 168 PA vs. LHP, ranking 9th in the majors in OPS (1.003) and 10th in average vs. southpaws...Is tied with Melvin Mora (89) for 3rd on the OPACY all-time HR list...Passed Cal Ripken, Jr. (85) for sole possession of 4th place, August 8 vs. STL...Hit .301/.324/.486 with 16 HR and 54 RBI in 94 games before the All-Star break...Collected career-high tying 5 RBI, July 19 @OAK, becoming one of 6 players since 1914 with BB, HR, 2SB & 5RBI in a game...Posted the 5th multi-HR game of his career and 2nd this season, July 21 @LAA...Became the first Oriole since Robert Andino (June 14, 2009) to steal home on August 28 vs. TB...Posted his 6th career multi-HR game, going 2-for-4, 2HR, 2R, 4RBI, September 20 vs. BOS...Started all seven postseason games and hit safely in five of the seven tilts, batting .222/.323/.333 with a home run and three RBI in 31 plate appearances...Hit a two-run home run in the third inning of ALCS Game 2 off of Yordano Ventura...Won his fourth career Gold Glove Award, his third straight, after leading AL center fielders in games played (155) and ranking fourth in assists (7) and fifth in putouts (374). In 6th season with the O's, was named to 3rd AL All-Star Team, won 3rd career Gold Glove and 1st Silver Slugger Award... Was the leading vote getter among all AL OF (6,793,577), the 3rd highest vote total for any AL player... Went 1-for-3 with a 2B & R in All-Star Game... Was the 1st Oriole OF in club history to be honored with a Silver Slugger Award... Led AL outfielders in HR (33) and RBI (108) and was 3rd in doubles (35) and SLG (.493) and 6th in AVG (.285)... Joined Paul Blair (seven straight, 1969-75) as the only O's OF to receive a Gold Glove in consecutive seasons... Led AL CF in G (156), assists (11) and putouts (352 - led AL CF for 3rd time in the last 4 seasons) and ranked 3rd in fielding % (.995)... Finished the season in the AL top-10 in: AB (2nd - 653); RBI (3rd - 108); R (4th - 100); G (T-4th - 160); HR (6th - 33) & H (8th - 186)... Joined by only teammate Chris Davis, Miguel Cabrera and Paul Goldschmidt with a 30-HR, 100-R, 100-RBI season in 2013… Jones/Davis combined for the 10th and 11th such season in club history (1st since Tejada in 2004)... Became the 2nd O's OF with three 25+ HR seasons (also Frank Robinson)... Is one of seven hitters to record 25+ doubles and HR in each of the last three seasons (also Beltre, Bruce, Cabrera, Cano, Fielder and Soriano)... Has hit 30+ HR in consecutive seasons…Joined by Jay Bruce as only hitters in MLB to have 35+ doubles and 30+ HR in both 2012 and 2013... Recorded his 3rd career three-hit game on Opening Day, April 2 @TB (also 2009 and 2010)... Over his last five Opening Days, is batting .476 (10-21) with four doubles, a triple, a homer, five runs scored and five RBIs... Had four season-long 9-game hit streaks: April 2-11 and 20-28, June 12-21 and August 1-11... Hit 9th inning game-winning HR off Rivera, July 7 @NYY... Had 3rd career two-HR game, July 26 vs. BOS... Tied career-high with four hits, August 6 @SD... Hit 30th HR, collecting 100th RBI, September 5 vs. CWS, his first 100 RBI season... On September 25 vs. TOR, snapped 322 consecutive games played streak (dating back to 9/26/11)... Set new career-high with 33rd HR, September 27 vs. BOS... Batted .292/.326/.513 with 28 of his 33 HR in 129 G (549 PA) out of the clean-up spot... Hit .358/.389/.582 with 4 HR and 15 RBI in 16 games (72 PA) vs. the NL West... Batted .182/.240/.227 in 22 AB in the World Baseball Classic, adding 2R, 2B, 4RBI and 2SB in 6G... Two-RBI double vs. Team Canada helped Team USA advance to round 2. Named Most Valuable Oriole, setting single-season career-highs with 151 G, 26-2B, 25 HR, 83 RBI, 12 SB, 53 XBH and a.466 SLG % ... 16 assists led all ML CF and was second among all AL OF ... Is fifth in the majors with 41 assists since becoming an Oriole in 2008 ... Had season-high 9G hit streak, August 12-21 (.455; 15-33)...Had 8G hit streak, July 30-August 6 (.364; 12-33) ... Had a 7-game RBI streak, June 18-25, collecting 9 RBI in that span ... Hit first career walk-off home run on May 24 vs. KC off Joakim Soria...It was the first walk-off homer for the Orioles sinceAugust 9, 2010 when Brian Roberts went deep off Chicago's J.J. Putz in the 10th inning ... Tied career-high with 4 hits three times: May 11 vs. SEA, June 17 @WAS and August 20 @LAA ... Collected season-high 4 RBI, August 6 vs. TOR ... Hit safely in 21 of 26 games w/ an AB in May, collecting 11 multi-hit games and batting .343/.390/.463 on the month ... Batted .295 with 21 HR and an .829 OPS in 454 PA vs. RHP and .242 with 4 HR and a .665 OPS in 164 PA vs. LHP ... Hit 19 of his 25 HR at home, slugging .551 at OPACY compared to .379 on the road ... Batted .383 with a 1.072 OPS in 16 games in the clean-up spot ... Hit .328 (20-61) with 22 RBI in 65 PA with 2 outs and runners in scoring position ... Batted .339/.397/.559 with 6 XBH and 9 RBI in 18G vs. BOS ... Hit .591/.625/.909 with 4 XBH and 6RBI in 6 G vs. SEA. Named Seattle organization's Minor League Player of the Year for the second time after leading Marinerminor leaguers with a .314 batting average while finishing tied for the organization lead in home runs (24)and tied for third in RBI (84)...Was named to the AAAAll-Star team by both Baseball America and Topps...Also was named a secondteamminor league All-Star by Baseball America...Finished 3rd in the Pacific Coast League a .586 slugging percentage...Started in the 2007 AAA All-StarGame and was named PCL Player of the Week, June 11-17...Was recalled from AAA Tacoma on August 3 and made his season debut for Seattle that night, startingin left field vs. Boston...Went 2-for-4 and scored 2 runs...Appeared in 38 games combined between the three outfield positions, making 16 starts (LF-11, CF-3,RF-2)...Recorded a career-high 3 hits and 4 runs on August 9 at Camden Yards vs. the Orioles...The 4 runsscored set Mariners single-game record by a rookie...Hit one of two home runs on the season and a season-high 2 RBI on August 30 at Cleveland...Had a game-tying pinch-hit home run in the 8th inning on September 12 vs. Oakland...Hit safely in 7 of 9 games with an at-bat, August 30-September 19, batting .375 (9-24) with 4 runs, one double, 2 home runs and 4 RBI...Began his second straight season at Tacoma, appearing in 93 games in CF and 8 in RF...Had 4 multi-homer games and hit 2 leadoff home runs, May 10 at Round Rock and June 1 vs. Omaha...Scored 11 runs during a 5-game stretch, May 10-17...Recorded a run in a season-high 7 consecutive games, July 8-17...Went 5-for-5 with a run scored, 2 extra-base hits and 3 RBI on July 17 at Salt Lake...Recorded 34 multi-hit games, including 13 three-hit games, 3 four-hit games and one five hit game...Had 22 multi-RBI games. Jones had a two-out, two-run, pinch-hit single in a 10-inning victory over Texas on Sept. 19. Hit his first Major League home run on Aug. 10 at Texas. Jones had his first Major League hit on July 18 in Baltimore. That hit snapped an 0-for-12 skid to start his Major League career. That was the longest hitless skid for a Mariner to open a career. Jones made his Major League debut on July 14. He hit .287 with 16 home runs and 62 RBIs with Triple-A Tacoma. Split the season between Class-A Inland Empire and AA San Antonio (AA), setting career-highs in hits (148), doubles (30), triples (8) and home runs (15) and earning Mariners' Minor League Player of the Year honors...Started season with Inland Empire, hitting safely in 50 of 68 games...Recorded a season-high 11-game hit streak, batting .468 (22-47) with 14 runs, 7 doubles, 2 triples, 3 home runs and 13 RBI, May 21-June 1...Was promoted to San Antonio on June 22...Batted .352 (31-88) with 14 runs, 9 extra base hits and 6 RBI in 25 games in July...Played for the Peoria Javelinas in the Arizona Fall League following the season and was converted from shortstop to center field. Led Class-A Wisconsin in RBI, games played, hits, multi-hit games (42), multi-RBI games (17) and total bases (206)...Had a season-high 9-game hitting streak June 8-17...Hit a grand slam at Quad City on May 25...Recorded his first career multi-homer game on July 31 at Battle Creek...Was transferred to Class-A Inland Empire on September. Began his pro career with Rookie-level Peoria...Hit safely in 7 of 8 games to start his career...Had 8 multi-hit games, including four 3-hit games...Was promoted on September 2 to Class-A Everett, where he had 3 multi-hit games in 3 starts. 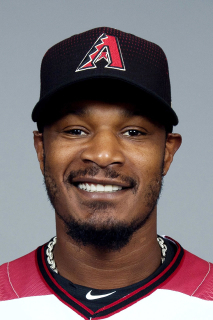 March 11, 2019 Arizona Diamondbacks signed free agent CF Adam Jones. October 29, 2018 CF Adam Jones elected free agency. August 20, 2018 Baltimore Orioles activated CF Adam Jones from the bereavement list. August 17, 2018 Baltimore Orioles placed CF Adam Jones on the bereavement list. November 6, 2009 Baltimore Orioles activated CF Adam Jones from the 60-day disabled list. September 8, 2009 Baltimore Orioles placed CF Adam Jones on the 15-day disabled list retroactive to September 2, 2008. Sprained left ankle.